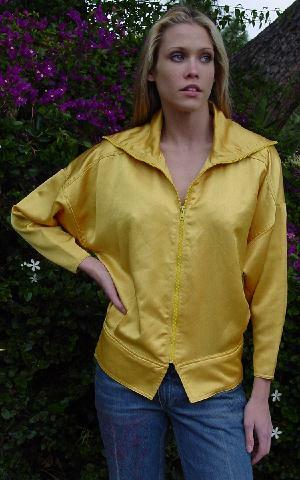 This sunflower yellow Bulgara jacket is by Hiroko Koshino and was made in Italy. 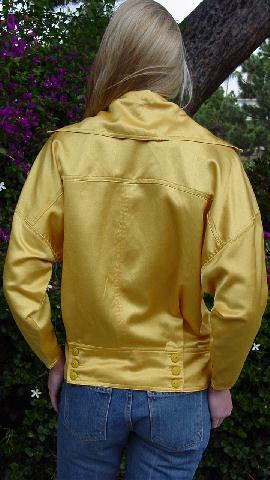 It has a 24" zipper that goes from the top of the collar down to the top of the 3 1/2" wide waistband. There are some light red spots (makeup that happened during the photo shoot) by the right and left sleeve armhole seams and to the right of the zipper (8" from the bottom of the jacket). The front has 4 open darts extending downward from the waistband. The back panel has a foldover 2" opening on each side where it is attached to the waistband by 3 yellow buttons on each side. It has a wide back yoke. There are a few snags. It has very small wrist openings (3 1/4" side to side). 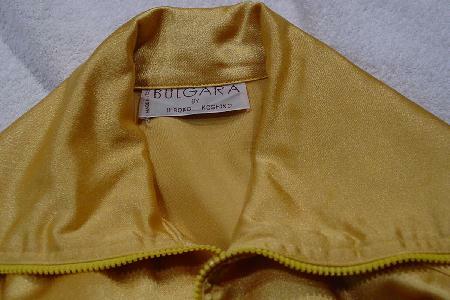 It belonged to a Czech model who wore it in a photo shoot and liked it so much she bought it and wore it for two seasons. shoulder to shoulder 25 3/4"